This recipe for Glazed Italian Sausage is more of a method to cook sausage than it is a recipe. My mother is Hungarian and cooks just about everything with paprika. This is how she cooks sausage, and my kids love them! 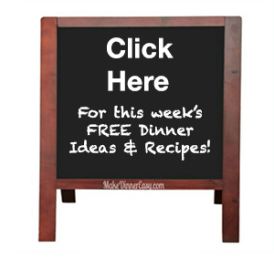 This is a great way to cook sausage if you need cooked sausage for a recipe such as Jambalaya. This sausage is also delicious served on a bun or as a stand alone entrée. In our family, I often use this method to cook sausage the night before a holiday breakfast. It warms up easily in the microwave, and makes breakfast much easier to prepare. 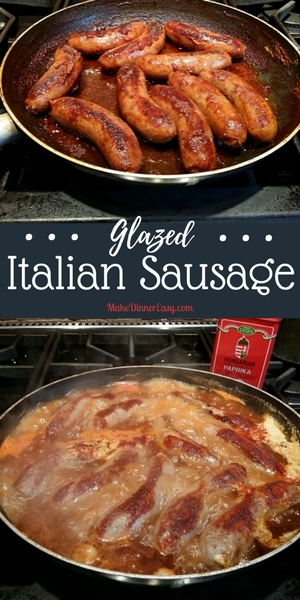 Although the recipe calls for Italian Sausage, any type of sausage works just as well. 2. Turn burner heat on high and bring the water to a boil. 3. Cover pan and reduce heat to low. 4. Cook with the cover on for a total of 30 minutes. During that 30 minutes you will need to turn the sausages and check the water level by doing the following: After an initial 10 minutes, uncover and turn sausages over using tongs. Add an additional 1/3 cup of water and sprinkle an additional 1-2 teaspoons of paprika on top of sausages. Cover and cook an additional 10 minutes. 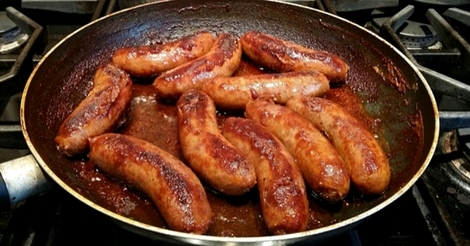 Uncover, turn sausages again and check the water level, add a little more (1/4 cup) if necessary to prevent scorching. 5. After 30 minutes, uncover the pan. There should be paprika colored liquid in the bottom of the pan. Continue to cook, uncovered over low heat, for an additional 4-6 minutes turning sausage often with tongs. The outside of the sausages will start to glaze as the liquid in the pan evaporates. Continue to cook until all the liquid is gone and the glaze on the sausages is to your liking. Serve or use in a recipe calling for cooked sausage. 6. If you pan is really messy after you’ve finished cooking the sausage, fill ½ way with water, cover and bring to a boil for a few minutes to loosen any cooked on residue and to make clean up easier.